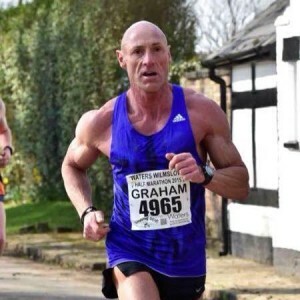 I had been a keen and quite successful runner in my earlier years, but by the time I had hit my 28th birthday I’d had enough and hung my trainers for what I thought would be for good. I began a weight training programme over the next couple of decades which I maintained until today. Some things I have adapted slightly over the years, but I still follow the same basic exercise plan. I like to be in control of myself so whatever successes or failures that I may or may not achieve would fall firmly upon myself. 18 years later I started jogging again to lose a little bit of weight and gain some much needed fitness. I acquired an entry for the 2012 London Marathon and set myself a goal of breaking the 3 hour barrier. I trained well for the race a managed to run 2hrs 59mins 30secs. 12 months later I again stood on the start line of The London Marathon. I had trained a little harder this year and dropped a little bit of body weight. Not much, but I thought every little would help. I finished the 2013 race in 2hrs 47mins 42secs. Nearly a 12 minute improvement; I was becoming once more hooked on running and the feel of being fit. 2014 came and once again I ran the London Marathon. My training and diet had been much stricter this year. 5 weeks before the race I ran a half marathon and to be honest I was 2 mins slower than what I had wanted. The following day, for some reason I attempted to get out of bed and I discovered a pain at the base of my right shin. I couldn’t run for the next 3 weeks, the 3 most important weeks of a marathon training programme. Fortunately 2 weeks before the race the pain had subsided enough for me to begin running at precisely the time that I should start easing down. I had 7 good days training and then 7 days off to ease down before the marathon. I ran 2hrs 43mins 2secs. I was pleased as I suffered no pain at all during the race, so no complaints at all. In August of 2014, my son Ben text me to say that the 2015 London Marathon was to be held on April 26th. This date was significant for me as it was to be 9 days after my 50th birthday. Over the next few weeks a plan began form in my mind. 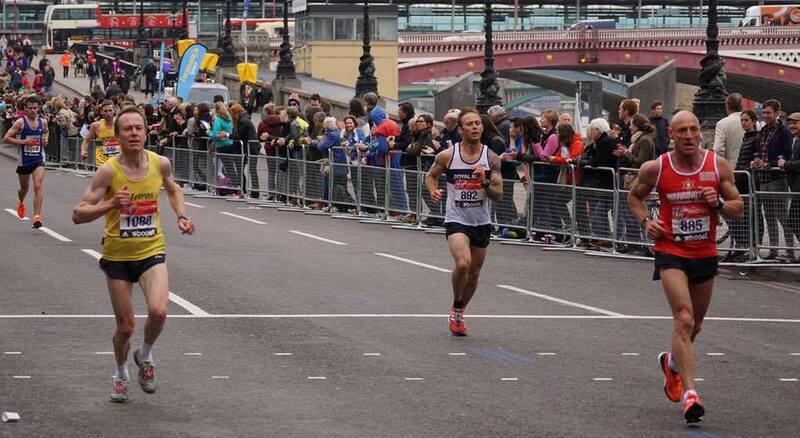 The plan was for me to go and win the over 50’s race at the 2015 Virgin London Marathon. By mid-September I started my build up for the 2015 race. I had to be honest with myself, the most important thing for me do was to lose some serious weight. It’s no good buying the most expensive lightweight racing shoes that money can buy if I was 8-10kg overweight. I decided that for every 1kg of body weight that I could lose I would run 2 minutes faster over the marathon distance. I began a strict diet, and began to put down a serious base for my 12 week specific marathon build up which would begin in the middle of January. I decided on the standard 1 long run per week starting off at 16miles, so by the time Christmas arrived I would be comfortably able to run a 20mile run at a decent pace. One or two repetition sessions per week depending on my shifts at work. I needed to be able to comfortably run mile repetitions at 5.20 mile pace and half mile repetitions at 5.00 pace. This would enable me to run long distances at a much faster pace than usual. I needed to make my steady run pace much faster than I was used to and that is exactly what this repetition training did. After the new year, it really was time to get serious. My bodyweight began to drop and as a result of this my fitness accelerated and my overall training speed began to exceed what I was aiming for. Some weeks were slightly easier, some weeks slightly harder. Some weeks I would run 4 x 2mile ( 90 secs rec) in 10m 40secs instead of 6x1m, and some weeks I might run 8 x 1k. A lot depended on the weather and my shifts at work. I was still weight training 4-5 times per week but with much reduced weight. I stopped all leg weight exercise on January 1st. I needed my legs to be fresh for running. I ran a 10k in February in 32m 24secs and then a half marathon 5 weeks out from London in 71mins 37secs. After the half marathon I ran my 3 hardest weeks training before a 10 day ease down to prepare for the race. I travelled down to London on 24th April, 2 days before race day to stay with my so Ben at his flat in Wimbledon. My training had gone to plan and I was ready for the race.